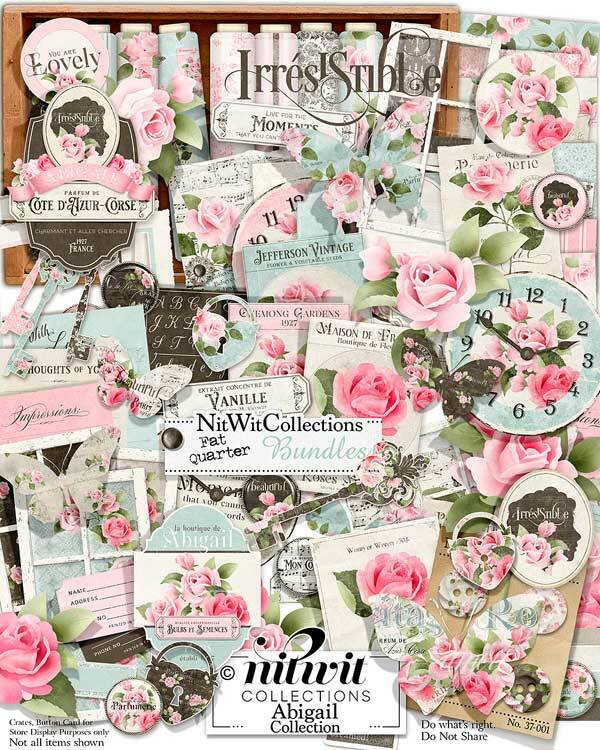 FQB "Abigail" Collection radiates with beauty and elegance so that you will be able to create many varied scrapbook layouts, cards and mini albums from. The vintage and somewhat cottage chic style of this digital kit shines through in each of the background papers and elements. Upon opening this folder you will see the worn seed packets, a little bit of lace on a background paper, colourful and elaborate butterflies, amazingly designed vintage labels and of course the pink roses! This is just the beginning of the expanse of these digital elements and papers that you will have to create with. Now to let your creativity flow and create....Life is in the Details! 4 Well worn digital brads...why not use them like you would a thumbtack? 5 Buttons covered in patterns and colours of this digital kit...don't miss using these vintage elements! 1 Circle label - "You Are Lovely"
6 Elegantly designed journal labels with a vintage flair, and lined of course to keep your writing "in line"
1 Label - "Live for the Moments...."
1 Elaborate label - "Irresistible...."
1 Distinguished label in the teal and pink colours that you will not want to miss using! 1 Primer sampler containing letters and numbers....what are the keys to your heart?? 1 Digital stamp sentiment - "Irresistible"
4 Tickets for your to fill in the details....which colour is drawing you in?